What a beautiful day we had on Saturday! 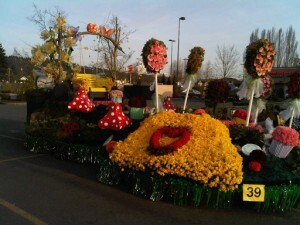 Not only was it beautiful out but there was a parade as well. 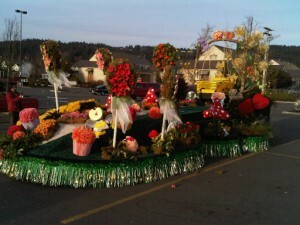 As I sat outside my local Starbucks in Sumner, I got to watch part of the yearly spectacle called the Daffodil Parade. As I sat and watched the Parade route take shape, I was able to watch people arrive and try and get a spot on the street so they could get a view of the floats, marching bands, clowns and other numerous participants. But what I noticed most, as I sat in the sun drinking my good cup of coffee, were the people who came to watch the parade. We love parades! People from every generation were there, people from all walks of life, parents pushing babies in strollers, couples walking hand in hand, people gathered from miles around crowding in much closer to one another than is normally thought comfortable, all for a parade. Why do people love parades? Why were they all there? I know it was one of the most beautiful days of the year but there is more to it than that. Personally I think we love parades because all the marching bands in their uniforms, the floats etc., remind us of the best parts of ourselves. Parades give us a sense of togetherness, a sense of promise and hope, they make us smile and laugh and the children watch in awe. It all reminds me that we as human beings, God's own special creation, have so much more in common than we often remember. So I hope you enjoyed the weather and, whether you were at the parade or not, remember to enjoy the simple things in life that bring us together.